The longer we wait for Bell to release the Pre, the more rumors seem to pop up. Today's rumor seems to fall in line with what we've heard before, but at the same time is a bit unrealistic. WebOS-France today is reporting (translation here) that Bell will be releasing the Pre on August 1st. The source of this information is reportedly one of the heads of Bell no less. An August 1st release date would fall in line, generally, with the 2 previous release date rumours of an end-of-July launch. Considering the credibility of the previous sources, this certainly seems good. 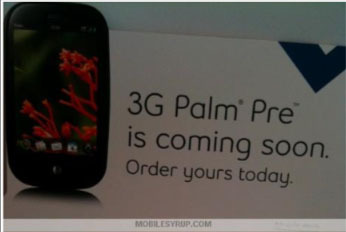 In addition, MobileSyrup is reporting that Bell stores now have in-store advertisements (as shown in the picture above). It's interesting that it says "Order yours today" when no price or date is given. However it does seems to imply Bell stores are now taking Pre orders. Now while I and many other would like to believe we'll be seeing Bell launching the Pre on the 1st, it just seems unrealistic. It's just too soon. 3 days just doesn't seem like a practical timeframe to announce and then sell the Pre. It'd be foolish to discount these rumors altogether, but keep in mind Bell's Pre contest doesn't even end until September 1st (with a drawing September 7th).